Soldiers of the victorious People's Liberation Army enter Beijing in June 1949. The Chinese Civil War (Traditional Chinese: 國共內戰; Simplified Chinese: 国共内战; pinyin: Guógòng Neìzhàn; literally "Nationalist-Communist Civil War") or (Chinese: 解放战争; pinyin: Jiefang Zhanzheng; literally "Revolutionary War"), which lasted from April 1927 to May 1950, was a war in China between the Kuomintang (KMT or Chinese Nationalist Party) and the Chinese Communist Party (CPC). The war began in 1927, after the Northern Expedition. The war represented an ideological split between the Western-supported Nationalist KMT, and the Soviet-supported CPC. The civil war carried on intermittently until the two sides were forced to form a temporary Second United Front in 1936 to resist the invasion of Manchuria by Japan. After Japan's defeat in World War II by the Allies in August 1945, the KMT and the CPC were unable to form a coalition Chinese government, and full-scale civil war resumed in 1946. Hostilities ended unofficially after 23 years in 1950, with the CCP in control of mainland China (including Hainan Island), and the KMT restricted to their remaining territories of Taiwan, Pescadores, and the several outlying Fujianese islands. No official armistice has ever been signed, although the two sides now have close economic ties. After the collapse of the Qing Dynasty in 1911, China fell under the dominance of several major and lesser regional warlords. The anti-monarchist and national unificationist Kuomintang party and its leader Sun Yat-sen sought the help of foreign powers to defeat these warlords, who had seized control of much of Northern China. Sun Yat-sen’s efforts to obtain aid from the Western democracies failed, and in 1921 he turned to the Soviet Union. The Soviet leadership, hoping that the two groups would consolidate under Communism, but prepared for either side to emerge victorious, decided to support both the Kuomintang (KMT) and the newly-established Communist Party of China (CPC). In 1923, Sun Yat-sen and Soviet representative Adolph Joffe issued a joint statement in Shanghai, pledging Soviet support for the unification of China. The Sun-Joffe Manifesto was a declaration of cooperation among the Comintern, KMT and the Communist Party of China.In 1923, Comintern agent Mikhail Borodin arrived in China to aid in the reorganization and consolidation of the KMT along the lines of the Communist Party of the Soviet Union. The CPC joined the KMT to form the First United Front. The membership of the CPC was only 300 in 1922 and 1,500 by 1925. The KMT had 50,000 members in 1923. CPC members were allowed to join the KMT on an individual basis. Just months after Sun Yat-sen's death in 1925, Chiang Kai-Shek, as commander-in-chief of the National Revolutionary Army, set out on the Northern Expedition (1926–1927), a military campaign to wipe out feudalism and end the dominance of the warlords.. By 1926, however, the KMT had divided into left- and right-wing factions, and the Communist bloc within it was also growing. After thwarting an alleged attempt to kidnap him during the Zhongshan Warship Incident in March 1926, Chiang imposed restrictions on CPC members' participation in the top KMT leadership and emerged as the pre-eminent KMT leader. Government troops rounding up prisoners. In early 1927, the KMT-CPC rivalry led to a split in the revolutionary ranks. The CPC and the left wing of the KMT had decided to move the seat of the KMT government from Guangzhou to Wuhan, where Communist influence was strong. But Chiang and Li Zongren, whose armies defeated warlord Sun Chuanfang, moved eastward toward Jiangxi. The leftists rejected Chiang's command and Chiang denounced the leftists for betraying Sun Yat-sen's Three Principles of the People by taking orders from the Soviet Union. According to Mao Zedong, Chiang's tolerance of the CPC in the KMT camp decreased as his power increased. On April 7, Chiang and several other KMT leaders held a meeting arguing that communist activities were socially and economically disruptive, and must be suppressed in order for the national revolution to proceed. On April 12, Chiang initiated a purge of the CPC in Shanghai, and hundreds of CPC members were arrested and executed. The incident, referred to as the “April 12 Incident” or the “Shanghai Massacre” by the CPC, widened the rift between Chiang and Wang Jingwei's Wuhan. Attempts were made by the CPC to take cities such as Nanchang, Changsha, Shantou, and Guangzhou. Peasants and CPC members in Hunan Province, under the leadership of Mao Zedong, staged an unsuccessful armed rural insurrection, known as the Autumn Harvest Uprising . There now were three capitals in China, the internationally recognized capital of the republic in Beijing; the CPC and left-wing KMT capital at Wuhan; and the capital of the right-wing KMT regime at Nanjing, which remained the KMT capital for the next decade. The CPC were expelled from Wuhan by their left-wing KMT allies, who, in turn, were toppled by Chiang Kai-shek. 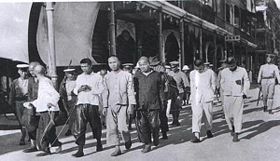 The KMT resumed its campaign against warlords and captured Beijing in June 1928. After this, most of eastern China was under the control of the Nanjing central government, which received prompt international recognition as the sole legitimate government of China. The KMT government announced that it was in conformity with Sun Yat-sen's formula for the three stages of revolution: military unification, political tutelage, and constitutional democracy. During the 1920s, Communist Party of China activists retreated underground or to the countryside where they fomented a military revolt, beginning the Nanchang Uprising on August 1, 1927. They combined forces with the remnants of peasant rebels, and established control over several areas in southern China. The Guangzhou commune was able to control Guangzhou for three days and a "soviet" was established. KMT armies continue to suppress these rebellions, beginning the ten-year struggle known in mainland China as the "Ten Year's Civil War" (Simplified Chinese: 十年内战; pinyin: Shínían Nèizhàn). This lasted until the Xi'an Incident, when Chiang Kai-shek was forced to form the Second United Front against the invading Japanese. In 1930, an internal conflict within the KMT, the Central Plains War, broke out. Launched by Feng Yü-hsiang, Yen Hsi-shan, and Wang Ching-wei, its aim was to root out remaining pockets of Communist activity in a series of encirclement campaigns. There were a total of five campaigns. The first and second campaigns failed and the third was aborted due to the Mukden Incident. The fourth campaign (1932-1933) achieved some early successes, but Chiang’s armies were badly mauled when they tried to penetrate into the heart of Mao’s Soviet Chinese Republic. During these campaigns, the KMT columns struck swiftly into Communist areas, but were easily engulfed by the vast countryside and were not able to consolidate their foothold. Finally, in late 1933, Chiang launched a fifth campaign that involved the systematic encirclement of the Jiangxi Soviet region with fortified blockhouses. Unlike their previous campaigns, which had penetrated deeply in single strikes, the KMT troops patiently built blockhouses, about five miles apart, to surround the Communist areas and cut off their supplies and food sources. In October, 1934, the CPC took advantage of gaps in the ring of blockhouses (manned by the troops of a warlord ally of Chiang Kai-shek's, rather than the KMT themselves) to escape Jiangxi. The warlord armies were reluctant to challenge Communist forces for fear of wasting their own men, and did not pursue the CPC with much fervor. In addition, the main KMT forces were preoccupied with annihilating Zhang Guotao's army, which was much larger than Mao's. The massive military retreat of Communist forces, known as the famous Long March lasted a year and covered 12,500 km (25,000 li). The march ended when the CPC reached the interior of Shaanxi. Along the way, the Communist army confiscated property and weapons from local warlords and landlords, while recruiting peasants and the poor, solidifying its appeal to the masses. Of the 90,000-100,000 people who began the Long March from the Soviet Chinese Republic, only around 7,000-8,000 arrived in Shaanxi. Zhang Guotao's army, which took a different route through northwest China, was largely destroyed by the forces of Chiang Kai-shek and his Chinese Muslim ally, the Ma clique. The remnants of Zhang's forces eventually joined Mao in Shaanxi, but with his army destroyed, Zhang, a founding member of the CPC, was never able to challenge Mao's authority. Essentially, the great retreat made Mao the undisputed leader of the Communist Party of China. During the Japanese invasion and occupation of Manchuria, Chiang Kai-shek, who saw the CPC as a greater threat, refused to ally with the CPC to fight against the Japanese. On December 12, 1936, in the Xi'an Incident, KMT Generals Zhang Xueliang and Yang Hucheng kidnapped Chiang Kai-shek and forced him to accept a truce with the CPC. Both parties suspended fighting to form a Second United Front and concentrate their military resources against the Japanese. In 1937, Japanese airplanes bombed Chinese cities and well-equipped Japanese troops overran north and coastal China. The CPC and KMT Second United Front was an alliance in name only. The CPC hardly ever engaged the Japanese in major battles but proved efficient in guerrilla warfare. Cooperation and coordination between the CPC and KMT during World War II was minimal. In the midst of the Second United Front, the CPC and the KMT were still vying for territorial advantage in "Free China" (areas not occupied by the Japanese or ruled by Japanese puppet government). The situation came to a head in late 1940 and early 1941, when there were major clashes between the Communist and KMT forces. In December, 1940, Chiang Kai-shek demanded that the CPC’s New Fourth Army evacuate Anhui and Jiangsu Provinces. Under intense pressure, the New Fourth Army commanders complied. The New Fourth Army Incident led to the deaths of several thousand members of the CPC and effectively ended the Second United Front. 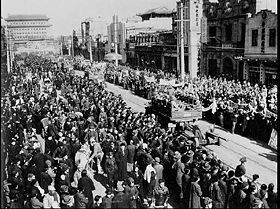 Developments in the Second Sino-Japanese War were to the advantage of the CPC. The KMT's resistance to the Japanese proved costly to Chiang Kai-shek. In their last major offensive against the KMT, "Operation Ichigo" in 1944, the Japanese were able to penetrate far inland and destroy much of what remained of Chiang's military resources. The brutal mass retaliation policies of the Imperial Japanese Army dispossessed large numbers of villagers who were easily recruited to the Communist ranks. The guerrilla operations conducted by the Communists inside occupied China, though of limited military value, heightened popular perception that the Communists were at the vanguard of the fight against the Japanese. By the end of the war, the Communists had gained the political support of large portions of the peasant masses in occupied China, though they were short of military supplies and small arms. The dropping of atomic bombs on Hiroshima and Nagasaki in 1945 caused Japan to surrender much more quickly than anyone in China had expected.. The first post-war peace negotiation was attended by both Chiang Kai-shek and Mao Zedong in Chongqing from Aug 28, 1945, to Oct 10, 1945. Both sides stressed the importance of a peaceful reconstruction, but the conference did not produce any concrete result. Battles between the two sides continued until the agreement was reached in January 1946, but major large-scale conflict between the two sides was avoided. In the last month of World War II in East Asia, Soviet forces had launched the mammoth Operation August Storm against the Japanese in Manchuria. This operation destroyed the fighting capability of the Japanese Kwantung Army and left the USSR in occupation of all of Manchuria at the end of the war. The 700,000 Japanese troops stationed in the region surrendered. When the war ended, Chiang Kai-shek, lacking the resources to prevent a CPC takeover of Manchuria, asked the Russians to delay their withdrawal until he had moved enough troops into the region. KMT troops were airlifted by the United States to key cities in North China, where the countryside was already dominated by the CPC. During this period, the Soviets systematically dismantled the extensive Japanese industrial base in Manchuria and shipped it back to their war-ravaged country. Under the terms of the Japanese unconditional surrender dictated by the United States, Japanese troops were ordered to surrender to KMT troops and not to the CPC who were present in some of the occupied areas. In Manchuria, Chiang Kai-Shek ordered the Japanese troops to keep fighting the CPC through September, a full month after their surrender. Chinese warlords who had cooperated with the Japanese in order to retain their power now switched their allegiance to the KMT. Chiang gave these local warlords titles and ranks in the Nationalist forces and ordered them to “keep order” by resisting the Communists. Chiang and his supporters hoped that they would be able to control the areas previously occupied by the Japanese until the KMT could deploy troops there. If they were defeated by the Communist forces, the warlords would lose their influence and the Communists would lose some of their military strength in the ensuing battles, making it easier for the KMT to take control. This strategy caused the KMT to lose popular support among the local peasantry, who were alienated when they saw Nationalist forces fighting alongside former Japanese collaborators. American Gen. George C. Marshall arrived in China to participate in the negotiation of a ceasefire between the KMT and the CPC, the terms of which were to include a coalition government encompassing all of the contending political and military groups in China. Neither the Communists (represented by Zhou Enlai) nor Chiang Kai-shek's representatives were willing to compromise on certain fundamental issues or relinquish the territories they had seized in the wake of the Japanese surrender. As part of the peace negotiations, the Nationalists (KMT) demilitarized 1.5 million troops, mostly warlords and their forces. Desperate and with no means of integrating themselves into civilian life, many of these disgruntled soldiers joined the Communists. (In Manchuria, Lin Biao's Communist forces, which had never exceeded 50,000, were swelled by almost half a million demilitarized Nationalists.) These well-trained, combat-hardened veterans educated the illiterate Communist peasant soldiers in the use of military hardware, and helped them recover large quantities of Japanese weaponry that had been stockpiled in secret caches all over the rural areas of Manchuria. The Soviets, expecting either a power-sharing arrangement or a KMT victory, did not provide direct support to the CPC during this period, and supplied only enough arms to outfit about 20,000 Communist troops. General Marshall himself stated that he knew of no evidence that the CPC were being supplied by the Soviet Union..
During this period, the CPC also demobilized approximately 1 million troops, mostly people who were deemed ideologically “unreliable” and were frequently killed or persecuted by their former comrades. Many defectors from wealthy or middle-class families joined the Nationalists as fervent anti-Communists. The Communists also used the cease-fire period to arm and train large numbers of peasants who had joined the People's Liberation Army during the war with Japan. On June 26, 1946, the truce between the CPC and the KMT broke down, and China entered a full-scale civil war that lasted more than three years. Communist media and historiography refer to this period as the "War of Liberation" (Simplified Chinese: 解放战争; pinyin: Jiěfàng Zhànzhēng). Marshall was recalled in January 1947, at the same time that the last Communist envoys in Nationalist controlled regions were recalled to Yan'an. The United States assisted the KMT with hundreds of millions of dollars worth of new surplus military supplies and generous loans of military equipment. The U.S. also airlifted many KMT troops from central China to Manchuria. Nevertheless, the CPC, who had already situated themselves in the north and northeast, were poised to strike. In March, 1947, the KMT seized the CPC capital of Yenan. By late 1948, the CPC had captured the northern cities of Mukden and Changchun. The KMT position was bleak. The KMT had the advantage of numbers and weapons, and benefited from considerable international support, but low morale hindered their ability to fight. Though they administered a larger and more populous territory, civilian support was eroded by corruption in the Nationalist administration. A hyperinflation crisis afflicted the KMT, and the economy between the years 1946-1949 witnessed the growth of enterprises offering welfare services to sustain workers' standard of living. After numerous set-backs in their attempts to gain control of the cities, the CPC ultimately seized Manchuria with the decisive Liaoshen Campaign. The capture of large KMT formations provided the CPC with the tanks, heavy artillery, and other combined-arms assets needed to carry out offensive operations south of the Great Wall. By April 1948, the city of Loyang fell, cutting the KMT army off from Xi'an. Following a fierce battle, the CPC captured Jinan and Shandong province on September 28, 1948. The Huaihai Campaign of late 1948 and early 1949 secured east-central China for the CPC. These encounters decided the military outcome of the civil war. The Beiping-Tianjin Campaign, which lasted 64 days from November 21, 1948 to January 31, 1949, resulted in the Communist conquest of northern China. 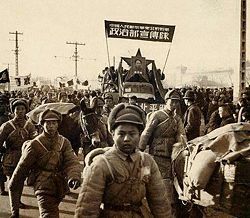 The CPC brought 890,000 troops from Manchuria to oppose some 600,000 KMT troops. The People's Liberation Army suffered heavy casualties while securing Zhangjiakou, Tianjin along with its port and garrison at Dagu, and Beiping. ; there were 40,000 CPC casualties at Zhangjiakou alone. During the campaign, approximately 520,000 KMT were killed, wounded or captured. On April 21, 1949, Communist forces crossed the Yangtze River, capturing Nanjing, capital of the KMT's Republic of China. In most cases, the surrounding countryside and small towns had come under Communist influence long before the cities. By late 1949, the People's Liberation Army was pursuing remnants of KMT forces southwards in southern China. 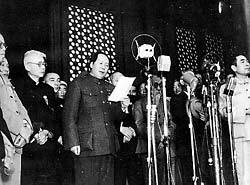 On October 1, 1949, Mao Zedong proclaimed the People's Republic of China with its capital at Peking, which was renamed Beijing. Chiang Kai-shek and approximately two million Nationalist Chinese retreated from the mainland to the island of Taiwan. There remained only isolated pockets of resistance, particularly in the far south. A PRC attempt to take the ROC-controlled island of Kinmen was thwarted in the Battle of Kuningtou, halting the PLA advance towards Taiwan. In December 1949, Chiang proclaimed Taipei, Taiwan, the temporary capital of the Republic of China and continued to assert his government as the sole legitimate authority in China. The last of the fighting ended with the Landing Operation on Hainan Island which resulted in the Communist conquest of Hainan Island in April, 1950, and Choushan island in May, 1950. No legal document to officially end the Chinese Civil War has ever been signed. With both contending governments PRC and ROC still in existence, the Chinese Civil War has not been legally resolved. In June, 1949, the ROC declared a "closure" of all mainland ports, and its navy attempted to intercept all foreign ships. The closure covered the region from a point north of the mouth of Min river in Fujian province to the mouth of the Liao river in Manchuria. Since the mainland's railroad network was underdeveloped, north-south trade depended heavily on sea lanes. ROC naval activity also caused severe hardship for mainland fishermen. After losing the mainland, a group of approximately 12,000 KMT soldiers escaped to Burma and continued launching guerrilla attacks into south China. Their leader, General Li Mi, was paid a salary by the ROC government and given the nominal title of Governor of Yunnan. Initially, the United States supported these remnants and the Central Intelligence Agency provided them with aid. After the Burmese government appealed to the United Nations in 1953, the U.S. began pressuring the ROC to withdraw its loyalists. By the end of 1954, nearly 6,000 soldiers had left Burma and Li Mi declared his army disbanded. However, thousands remained, and the ROC continued to supply and command them, even secretly supplying reinforcements at times. Most observers expected Chiang's government to eventually fall in response to a Communist invasion of Taiwan, and the United States initially showed no interest in supporting Chiang's government in its final stand. The United States changed its position with the onset of the Korean War in June 1950. It was no longer acceptable to allow a total Communist victory over Chiang, and President Harry S. Truman ordered the U.S. 7th Fleet into the Taiwan Straits to prevent the ROC and PRC from attacking each other. After the Republic of China complained to the United Nations about the Soviet Union’s support of the CPC, the UN General Assembly Resolution 505 was adopted on February 1, 1952 to condemn the Soviet Union. Though viewed as a military liability by the United States, the ROC regarded its remaining islands in Fujian as vital for any future campaign to retake the mainland. On September 3, 1954, the First Taiwan Strait Crisis began when the PLA started shelling Quemoy and threatened to take the Dachen Islands. On January 20, 1955, the PLA took nearby Yijiangshan Island, killing or wounding the entire ROC garrison of 720 troops defending the island. On January 24 of the same year, the United States Congress passed the Formosa Resolution authorizing the President to defend the ROC's offshore islands. The First Taiwan Strait Crisis ended in March 1955 when the PLA ceased its bombardment. The crisis was brought to a close during the Bandung conference. The Second Taiwan Strait Crisis began on August 23, 1958, with air and naval engagements between PRC and ROC forces, leading to intense artillery bombardment of Quemoy (by the PRC) and Amoy (by the ROC), and ended on November of the same year. PLA patrol boats blockaded the islands to prevent the passage of ROC supply ships. Though the United States rejected Chiang Kai-shek's proposal to bomb mainland artillery batteries, it quickly moved to supply fighter jets and anti-aircraft missiles to the ROC. It also provided amphibious assault ships to land supplies, as a sunken ROC naval vessel was blocking the harbor. On September 7, the United States escorted a convoy of ROC supply ships and the PRC refrained from firing. On October 25, the PRC announced an "even-day ceasefire"—the PLA would only shell Quemoy on odd-numbered days. The Third Taiwan Strait Crisis in 1995–1996 escalated tensions between both sides when the PRC tested a series of missiles not far from Taiwan. 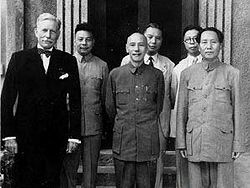 Beginning in 1971, with admission of the PRC to the United Nations, assuming China's seat at the expense of the ROC, and again in 1972, the strengthening of the relationship between the United States and the PRC began to threaten the position of Chiang's government. Chiang died before the United States severed diplomatic relations with Taiwan in 1979 in order to establish full relations with the PRC. Since the late 1980s, there have been dramatically increasing economic exchanges between the ROC and the PRC, while the Taiwan Strait remains a dangerous flash point. Beginning in the early twenty-first century, there has been a significant warming of relations between the KMT and the Communist Party of China with high level exchanges such as the 2005 Pan-blue visit. Since early 2008, ROC relations with mainland China have greatly improved with the election of KMT candidate Ma Ying-jeou as ROC president, as Ma, unlike his predecessor, does not actively promote Taiwan's independence rather than eventual reunification with China. In its August 11, 2008 edition, TIME Magazine wrote that in less than three months' time, "relations between Taiwan and China have arguably seen the most rapid advancement in the six-decade standoff between the two governments. Ma launched direct weekend charter flights between China and Taiwan for the first time, opened Taiwan to mainland tourists, eased restrictions on Taiwan investment on the mainland and approved measures that will allow mainland investors to buy Taiwan stocks." Feng Yuxiang (Changed his support to KMT in 1925, then fought them in 1930 Central Plains War and lost. Organized the Chahar People's Anti-Japanese Army in cooperation with north China Communists and changed again to CPC in 1945 and visited the USSR). ↑ News.bbc.co.uk China's stance. BBC News. Retrieved August 18, 2008. ↑ 6.0 6.1 6.2 G. Patrick March. Eastern Destiny: Russia in Asia and the North Pacific. (Greenwood Publishing Group, 1996, ISBN 0275955664), 205. ↑ Anne Biller Clark and Donald Walker Klein. Harvard Univ. Biographic Dictionary of Chinese communism. I (Original from the University of Michigan v.1., 1971, Digitized Dec 21, 2006), 134. ↑ William Theodore De Bary, Irene Bloom, Wing-tsit Chan, Joseph Adler. Sources of Chinese Tradition. (original 1960) (Columbia University Press. ISBN 0231109385), 328. ↑ 27.0 27.1 Guangqiu Xu. War Wings: The United States and Chinese Military Aviation, 1929-1949. (Greenwood Publishing Group, 2001, ISBN 0313320047), 201. ↑ Joshua H. Howard. Workers at War: Labor in China's Arsenals, 1937-1953. (Stanford University Press, 2004, ISBN 0804748969), 363. ↑ 37.0 37.1 37.2 Odd Arne Westad. Decisive Encounters: The Chinese Civil War, 1946-1950. (Stanford University Press, 2003, ISBN 080474484X), 192-193. ↑ Chris Cook, John Stevenson. The Routledge Companion to World History Since 1914. (Routledge, 2005, ISBN 415345847), 376. ↑ Roderick MacFarquhar, John K. Fairbank, Denis C. Twitchett. The Cambridge History of China. (Cambridge University Press, 1995, ISBN 0521243378), 820. History of "Chinese Civil War"
This page was last modified on 15 June 2018, at 21:18.